one of the best things about being a part of the handmade community is the trades. I used to love trading with artists, but I think the current price point of my jewelry (from $35-$275) might scare off most traders. anyway, I was scouring etsy for sellers that participate in trades and I found this amazing artist, jamie ribisi. 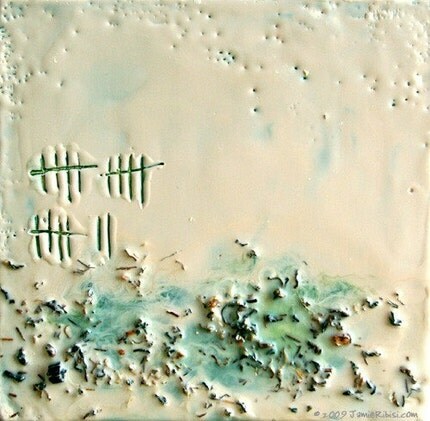 I fell in love with her “how much tea I drink in a week” encaustic painting series. “Ok, I have a problem. I *love* tea. 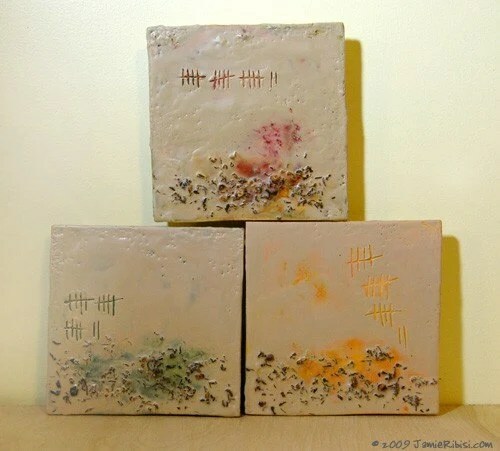 That may not sound like a problem but I *REALLY* love tea and when I made this group of paintings I actually sat down and figured out how much tea I drink in a week, on average. I drink about 17 cups of hot & iced tea a week. I’m ok with that, especially if there are cookies involved. check out her website and etsy shop! Wow– THANK YOU so much!! So cool to find this (thanks, google alerts!) Love your work, too!